Honestly I worry he might be peaking too soon. Where do you go from here? Surely a pig or cat would just feel like child’s play at this point. If you are going to showboat like this then you need to be prepared for the consequences. The children now have very high cake expectations, and I think I speak for the entire internet when I say, Show Me The Manatee. Also, clearly weekend breakfasts are in good hands around here so I see no reason why I should not be able to sleep in. Wake me when there is an edible marine mammal or forest creature on my plate. Extra syrup, please. This entry was posted in Uncategorized and tagged animal pancakes, cooking, NaBloPoMo by BananaWheels. Bookmark the permalink. Everything about this screams intensity. After animal pancakes, something tells me he’d make a good candidate for the International Chili Society’s World Championship chili cookoff. These guys are for real and the prize money is $25K! To say my family is intense about pancakes is an understatement. I’ll see if I can redirect him to the big bucks in chili. Everything about this makes me happy. And a little terrified – by the face of that bull on that plate. You mess with the bull, you get the horns – which in this case are bananas. So I guess you mess with the bull, you get the bananas. That bull does NOT look happy to go in your belly. Would it give you a bullyache? Ahahaha I’m sorry. Do NOT get this man a squeeze bottle, with which to make more elaborate shapes. Our neighbor had one when she invited us over for pancakes, and my kids have never let me live it down. HE ALREADY HAS ONE. I totally forgot about it and now I fear he will read this and remember it too, so I may need to delete this comment. Let’s never speak of it again. OMG, your comment prompt.. I love that movie. Anytime we go to overtake a car, I hear Tom Cruise say “I’m bringing him in closer, Merlin” and then Merlin says “God you’re WHAT?”. I have seen it so many times, especially the starting bit, because for years I worked in electronic sales and we would use the start of Top Gun to demonstrate home theatre systems. 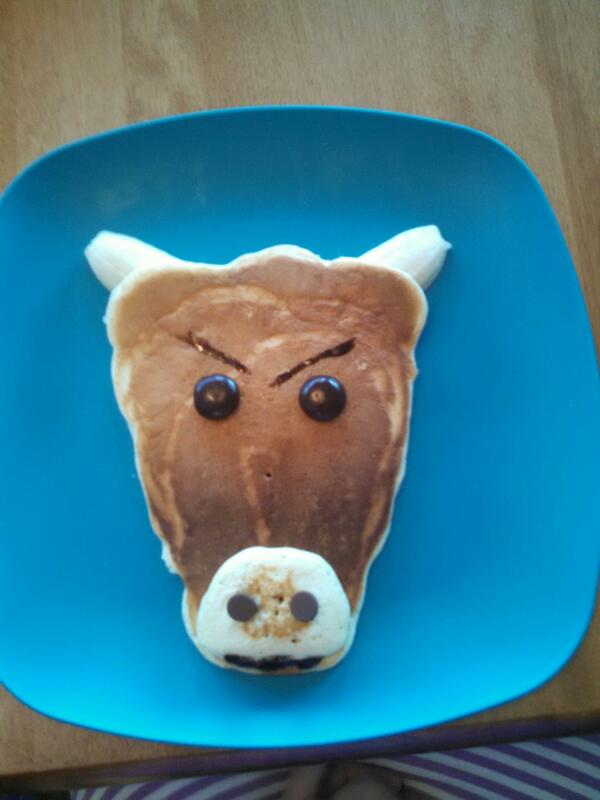 I love the bull pancake. I can tell this blog is a keeper so I’ll be reading along. Cool – thanks for stopping by, and Happy NaBloPoMo to you too!